Cambodia has achieved remarkable economic growth over the last two decades, and the poverty rate has decreased from 47.8 percent in 2007 to 18.9 percent in 2012. The Government is committed to achieving lower middle-income status by 2020. According to the World Bank, a significant portion of the population remains “near poor” as they are still at high risk of falling back into poverty at the slightest shock. The 2014 Cambodia Demographic Health Survey found that undernutrition rates remain a public health concern, with 32 percent of children under age five stunted, 24 percent underweight and 10 percent suffering from wasting. Micronutrient deficiencies are widespread. The maternal mortality ratio is 170 deaths per 100,000 live births, while the under-5 mortality rate is 35 per 1,000 live births—both significant improvements since the last such survey. Cambodia is highly vulnerable to natural disasters, with regular monsoon flooding in the Mekong and Tonle Sap basin and localised droughts in the plains. Rising inequality, landlessness and deterioration of common resources have eroded the coping capacity of food-insecure people. Limited access for the poor to education and health services and low levels of investment in public infrastructure further perpetuate food insecurity and undernutrition. WFP provides assistance to the most marginalized Cambodians living in the most food-insecure provinces through a five-year Country Program, which has been extended until December 2018. The program covers food and cash-based safety nets in the sectors of education, asset creation and livelihood support and nutrition. Food assistance is also provided in response to emergencies, when required. 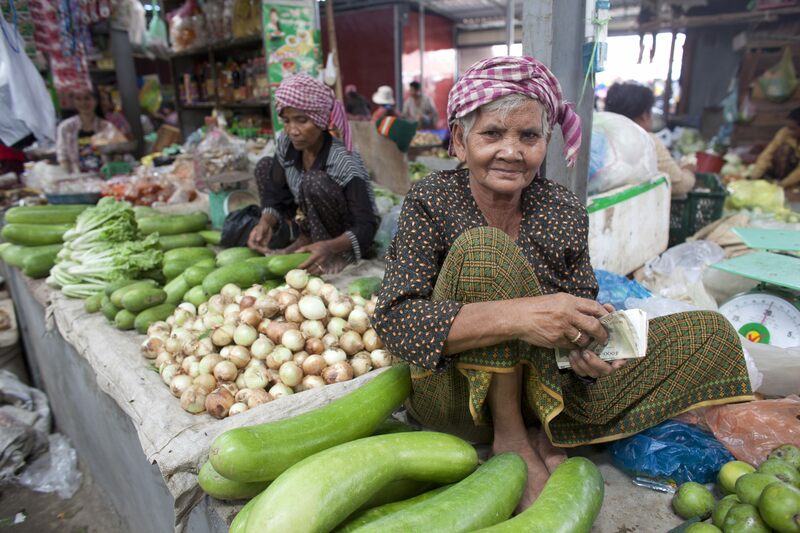 In 2015, WFP reached 466,100 people in Cambodia. With a preceding record of reaching up to 840,000 people annually since 2011, WFP’s school meals program, including the school meals and scholarship programs (cash or take-home rice rations granted to children with at least an 80 percent attendance rate), has supported universal access to primary education and promoted increased enrollment, retention and graduation. Building on this success, WFP is working with the Government to establish a national school meals program by 2020-21. WFP’s nutrition program aims to contribute to reducing malnutrition through improved young child feeding and public health measures such as rice fortification. Considering that Cambodia is one of the most disaster-prone countries in the region, WFP’s food-for-assets program aims to strengthen resilience and climate change adaptation amongst the most vulnerable communities.